If you’d asked me a fortnight ago where I’d be right now, sitting in a beautiful park overlooking Sydney’s Bondi Beach probably wouldn’t have been my answer. But it’s true – and I’ve got the sunburn to prove it. You may be asking yourself a few questions right now. 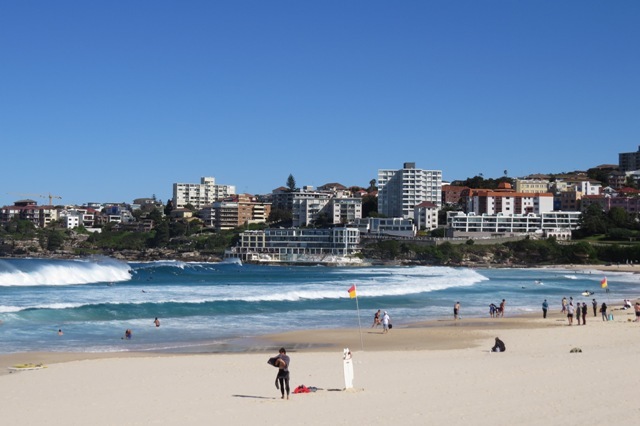 2) How did you get sunburnt in May in Australia? 3) Why are you sitting in a park overlooking Bondi Beach? Surely you should be surfing?! OK, first up, my name is Jo and I’m 25. 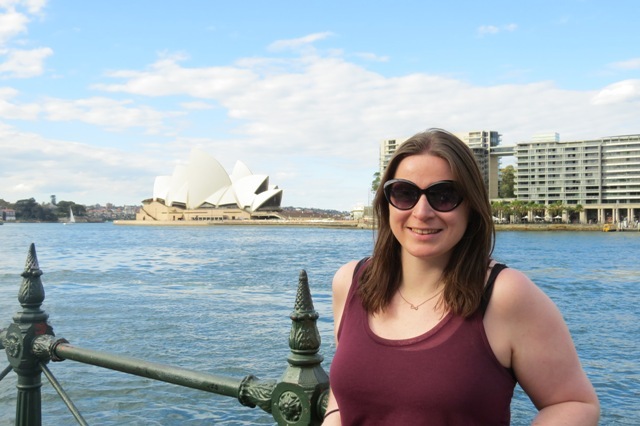 About six months ago, I applied for a Working Holiday Visa and then about two months ago, I quit my job in a library and then, about a week and a half ago, I landed in Sydney’s Kingsford Smith airport fresh-faced and ready for adventure. That last bit was a lie. I was definitely not fresh-faced nor ready for adventure. The only thing I was ready for after a 24 hour flight was a bed and a shower. I’m from Manchester in the UK, which should answer the second question. I have the clichéd British complexion and when I’m not burning, you could play dot-to-dot with my freckles. But mostly, I’m burning. When I’ve told people that I plan on travelling around Australia for at least a year, I’ve had to answer the same questions. My Visa allows me to stay and work in Australia for a year. With this Visa, I can do any work I want as long as I’m only there for six months. I also have the opportunity to extend my Visa for another year if I complete three months of rural work, which is something I definitely want to do. Not only because I want to extend my Visa to give me flexibility and to ensure I do everything that I want, but also because it just sounds so fun and different. This whole adventure is a challenge unlike any other I’ve been faced with and pretty much every day so far, I’ve been faced with something that pushes me out of my comfort zone. And working on a cattle ranch in the middle of the Northern Territory is pretty much as far out of this city girl’s comfort zone as I could get. It seems like the perfect opportunity to experience – pardon the cliché – “the real Australia” and to truly immerse myself in a completely different culture and lifestyle. And probably get eaten by a snake. Because I’ve always loved to travel but the circumstances have never been right until now. While I loved the actual job I had, I didn’t enjoy it for a few reasons, which are ones I won’t bore you by going into. And I didn’t see anything changing anytime soon. And when I graduated from university (English with Film Studies, by the way), I had to move back home and, although I love my parents, there’s something particularly tragic about a twenty-something flouncing and slamming doors when she’s in a strop. And I figured that if I didn’t do it now, I probably wouldn’t get the opportunity to do it again and that was too hard to think about. As much as I love being around others and I adore meeting new people, the thought of travelling with someone else on such a big trip never even occurred to me. I have a plan in my head; a list of all the places I want to go and things that I want to see and I’ve spent a lot of money and risked a lot to come here and it changes every day. But that’s the beauty of travelling alone. You can change your mind every day. So here I am, getting blown away by Bondi Beach. Both figuratively and literally. I’ve stayed in four hostels so far and I’m faring better than I thought I would. Sure there’ve been some nights where I’ve been denied sleep because of someone snoring like a freight train. And let’s not forget the horrific hostel where the people I had to share with had been living in the room for a year. But I’ve met some brilliant people already, all with their own stories and reasons for travelling. So I may be on my own, but I’m never completely alone. Next, I’m heading to the Blue Mountains. But right now, I’m going to get an ice cream because the view I’ve got right now almost makes me forget the cockroach I saw a few nights ago. I did the same when I was 18- traveled here on my own from the states. That was 6 years ago and I’ve never left nor do I plan on leaving (and with my new Aussie citizenship I can now stay forever). Best decision I’ve ever made! Good luck to you and watch out, Australia might capture you with its charm and beauty just like it did to me! I’m looking forward to reading all about your Aussie adventure, Jo! This entry was posted in Featured, Life, Travel and tagged column, life, on my own, on the run, travel. Bookmark the permalink.